Dule Pagoda (Slitary Joy), also called Great Buddha Pagoda (Dafosi), is one of the oldest and best-preserved tall wooden structures in China and situated inside the western gate of Jixian County of Tianjin Municipality. It was first built in the Tang Dynasty. 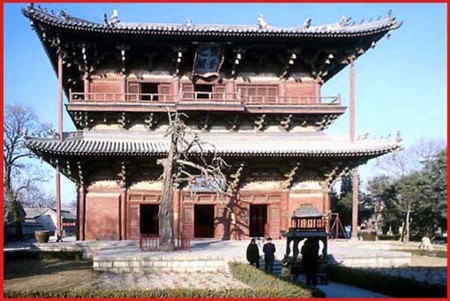 Its main building, the Goddess of Mercy Pavilion (Guanyinge), was rebuilt in 984 A.D. during the Liao Dynasty. The two-storied wooden pavilion is 23m high, and so well designed that it has withstood the test of several earthquakes and remains intact to this day.